Whenever I see the logo letters MER, first I think, Ah –Mermaid! then Mom Egg Review, and somehow these body-sea images of women’s magic beckon me to enter their depths. 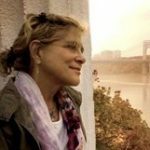 The poems and paintings you’re about to encounter, (hopefully you’ll stop and paddle around to see and experience from different angles) – are etched, colored, written by women in Seeking Your Voice: A Poetry and Memoir Workshop founded by my late loved teaching partner, Eva Oppenheim, and me. Early in our first discussion of writing for MER several of the students said, “Isn’t Mom Egg only about being a mother? “ So partly, from a chapter in my own life, I threw a curve ball at the group and asked them to consider “The Mother Dispossessed.” This idea is one among many visions/versions you may find in the poems gathered here. I also asked the students to explore their process in collaborating in the workshop, as well as for the presentation here. Several of the poets/artists/activists started out under the teaching brilliance of Charlotte Mandel in Translating Silences at the Barnard College Center for Research on Women. After Charlotte’s regretted retirement, Eva and I re gathered and continued with our own name. We thought what Charlotte gave us was too good to lose. The workshop grew (and sometimes shrank!) and changed. Too soon, a terrible illness took Eva from us, and not long after, Barnard removed all the Continuing Ed. Workshops she’d housed for decade, but we are stronger and better than ever at our new home, The Studio School, not far from the old nabe. We are aged 25-to-aging Boomers, hard of hearing, learning to listen. Listen to the poems. We’re physicians, speech therapists, teachers, grandmas, globetrotters, art scholars, data scientists, social workers — we are of the mother world. And we are so grateful to Marjorie Tesser and to Cindy and Jenn for inviting us to present our work to the MER VOX /Mom Egg Review community. As curator of this amazing collection, I am blessed by the voices and poems of the writing women who here offer MER VOX readers their wildly diverse stories of women’s lives. Esther Cohen: “We took a workshop together about finding our voices, and what we found was how our voices linked. Yours and mine. Of course, mothers are in a thousand parts. There are as many mothers and kinds of mothers and ways of mothers as people. So together, with the voices we all had, we said what mothers meant. “ (For more reactions of workshop participants, click here). This folio would not be possible without the generous, patient work of Srividya Kannan Ramachandran, poet artist and digital editor for “The Mother Dispossessed (and Re-claimed)”. Thank you Sri! The book in your hands is for the women in it.